So, in the Ozarks today, we've had our usual routine run of unpredictable weather. We had freezing rain craziness early in the week, and it's 60 degrees today. While that makes for a bit of sartorial whiplash, it also gets me the most wear out of my closet. I can wear my sweaters, boots, jeans, skirts, dresses, and sandals pretty much all in the same week! All that also means I get to rock bare legs sooner than expected, which means taking the time to shave. Tip #1: Pay attention to the direction of your hair growth! This doesn't just apply to legs, either. I remember the most revolutionary time I figured out how to shave my underarms, from another style blog years and years ago that escapes my memory now. Basically, you shave against the grain, then with the grain, then make an 'X' to finish up. The reason for that? Your underarm hair doesn't grow in one simple direction, so why would you shave it that way? This applies to anywhere hair grows where you decide you don't want it: legs, the backs of your knees, your underarms, or your face. Working with the grain always works better than fighting or disregarding it, and your skin will be happier and less irritated as a result. Do. Not. Skip. Shave. Cream. I know, sometimes you've run out or it's on a shelf that's not by the tub, or you're in a hurry and water just seems faster. It has been my experience that it would be better in that case to skip shaving and change outfit plans than risk the pain and irritation that improper shaving elements can cause. Also, don't forget to prep on your 'off' days if you have them. In my case, even with the best of shave creams and sharp razors, I will get razor burn if I don't skip a day in between shaves. On those skip-days, I've seen better luck with avoiding irritation if I still remember to lotion up and keep my skin hydrated and happy. The first time I shaved my legs, I borrowed my mom's razor without asking because I was a grown-up little tween that was going to take on this whole shaving ordeal myself. I hurried way too fast, didn't know what I was doing, and pushed down WAY too hard and ended up with two matching oval shaped marks on my shins where I basically skinned myself. There are still faint little scars on my legs from that, and you'd think I'd learned a little something from that. Of course, last week I was also in a hurry and in that rush, pushed wayyy too hard on parts of my skin as I was shaving. This translated to red, angry patches that just got angrier when I covered them up in jeans instead of the skirt I had planned on wearing. Don't push too hard. Shave twice if you need to, but be gentle with your skin. Your skin does such a good job of holding in your insides, you should baby it every chance you get! 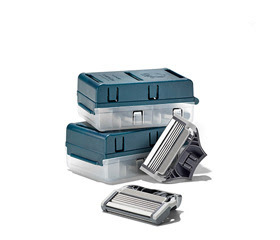 Tip #4: Keep your blades sharp, and storage is key. I swear I'm not lecturing, but if you keep your razor in your shower, you need to move it. The damp and warmth is going to breed bacteria, and if you cut yourself, that bacteria is going to end up in your skin and bloodstream. Also, it will dull your razor which will pull on your skin and not do nearly enough to cut the hair follicles efficiently. One way to keep up with sharp razors (once you've moved your razor to a better location of course! 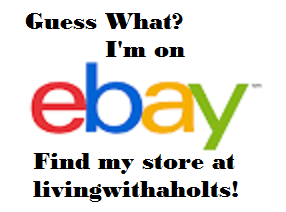 ), and definitely the easiest, would be a subscription box! 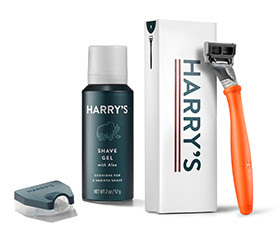 I'd recommend Harry's, since they offer a monthly box with high-quality 5 blade razor heads, at half the cost of comparable razors. Plus, they're delivered to your door with a bottle of shave gel, for the easiest way to keep up with your shaving needs. On top of that, and the real reason I love Harry's, is their Harry's 1+1 giving model. They donate 1% of every product purchase to worthy causes, and all employees donate 1% of their time to charity organizations. Great products with great ethics go a long way in my book! Are there any tips and tricks you'd like to share? I definitely am NOT the end all be all for shaving, and always love feedback! Let me know in the comments!